Gordon Brinckle (1915–2007) seemed like an ordinary man—a modest and reserved husband and father living in an ordinary 1950s-era home in Middletown, Delaware. Known around town as the night projectionist at the local movie theater, it was the unusual way he spent his days that eventually brought him attention. In his free time, Brinckle meticulously constructed a miniature version of a grand movie palace in his basement. The Shalimar, as he called it, was not only fully functional (with nine authentic movie seats, a projection booth with a 16-mm projector, numerous speakers, and a working organ) but was also lushly designed and decorated with an obsessive attention to detail. Brinckle's 'picture palace of renown,' as he referred to it, adapted various theater styles of the twentieth century, boasting a marquee that distinctly recalls the 1960s; an auditorium decorated in the 'semi-atmospheric' style of the 1930s, bringing the outdoors in through the use of fake foliage and wildlife; and three opulent working curtains. When filmmaker and photographer Kendall Messick, who used to live across the street from the Brinckle family as a boy, became reacquainted with his former neighbor during a visit home in 2001, he knew he had to document the theater and its one-of-a-kind creator. 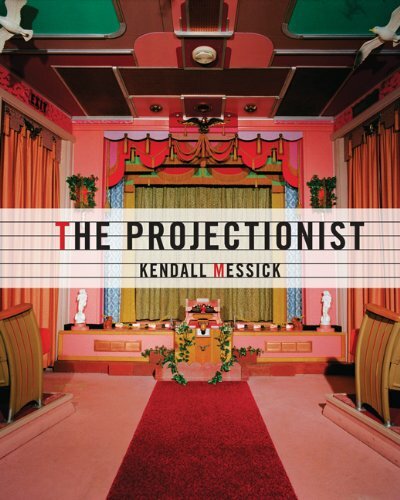 In The Projectionist, Messick captures every detail of Brinckle's colorful fantasy world, including Brinckle's original artwork, architectural plans, drawings, and linoleum prints of imaginary movie theaters, ticket stubs, and usher uniform designs. An essay by curator Brooke Davis Anderson of the American Folk Art Museum looks at Gordon's work in the context of outsider art, and a foreword by artist, curator, and author Mark Sloan discusses Messick's photographic work.